Countermay: The Tapestry of Worlds, crossroads of civilizations beyond imagining. Yet after a thousand years of war, Countermay is dying. Battles, curses, extraterrestrial parasites, demonic influence, and other hazards have ruined much of the planet. The food is running out. The threat of starvation looms. The only way to save Countermay is to seize undisputed control. Until then, armies march, fed with the ever-dwindling food as they churn farmland into mud with their boots. Can you save Countermay from its invitable doom? 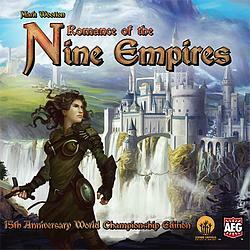 This is the 15th Anniversary World Championship Edition of Romance of the Nine Empires, the game where players determine the story! This boxed set holds the decks used by the top-placing players for each faction that made it to the quaterfinals at the 2012 World Championships at Gen Con Indy, and immortalized in Dead Gentlemen's documentary The Gamers: Hands of Fate. This is the ideal jumping-on place for this amazing game with its story so unpredictable, that only you, the players, can figure out where it goes next!